"New Christians", or Marranos, fled the Iberian peninsula to escape persecution and seek religious freedom during the 16th and 17th centuries. It is estimated that some reached northern areas of Colombia, which at the time was known as New Granada. Most if not all of these people assimilated into Colombian society. Some continue to practice traces of Sephardic Jewish rituals as family traditions. In the 18th century, practicing Spanish and Portuguese Jews came from Jamaica and Curaçao, where they had flourished under English and Dutch rule. These Jews started practicing their religion openly in Colombia at the end of the 18th century, although it was not officially legal to do so, given the established Catholic Church. After independence, Judaism was recognized as a legal religion. The government granted the Jews land for a cemetery. Many Jews who came during the 18th and 19th centuries achieved prominent positions in Colombian society. Some married local women and felt they had to abandon or diminish their Jewish identity. These included author Jorge Isaacs of English Jewish ancestry, the industrialist James Martin Eder (who adopted the more Christian name of Santiago Eder when he translated his name to Spanish) born into the Latvian Jewish community, as well as the De Lima, Salazar, Espinoza, Arias, Ramirez, Perez and Lobo families of Antillean Sephardim. Coincidentally, these persons and their families settled in the Cauca Valley region of Colombia. They have continued to be influential members of society in cities such as Cali. Over the generations most of their descendants converted or were raised as secular Catholics. During the early part of the 20th century, numerous Sephardic Jewish immigrants came from Greece, Turkey, North Africa and Syria. Shortly after, Jewish immigrants began to arrive from Eastern Europe. A wave of Ashkenazi immigrants came after the rise of Nazism in 1933 and the imposition of anti-Semitic laws and practices, including more than 7,000 German Jews. From 1939 until the end of World War II, immigration was put to a halt by anti-immigrant feelings in the country and restrictions on immigration from Germany. The Jewish population increased dramatically in the 1950s and 1960s, and institutions such as synagogues, schools and social clubs were established throughout the largest cities in the country. The changing economy and wave of kidnappings in the country during the final decade of the 20th century led many members of Colombia's Jewish community to emigrate. Most settled in Miami and other parts of the United States. Successes in the nation's Democratic Security Policy has encouraged citizens to return; it has drastically reduced violence in the rural areas and criminality rates in urban areas, as well as in spurring the economy. The situation in Colombia has improved to the extent that many Venezuelan Jews are now seeking refuge in Colombia. 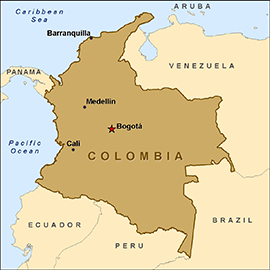 In the early 21st century, most of the Jews in Colombia are concentrated in Bogotá, with about 7,000 members, and Barranquilla, with about 6,000 members. Large communities of Anusim are found in Cali and Medellín, but very few practicing Jews. There are nine official synagogues throughout the country. In Bogotá, the Ashkenazi, Sephardic, and German Jews each run their own religious and cultural institutions. The Confederación de Asociaciones Judías de Colombia, located in Bogotá, is the central organization that coordinates Jews and Jewish institutions in Colombia. In the new millenia, after years of study, a group of non-ethnic Colombians with crypto-Jewish ancestry formally converted to Judaism in order to be accepted as Jews according to the halakha. They are called "crypto-Jews" or "lost Jews," and in recent years they have emerged in remote places as scattered as India, Brazil, the American Southwest and here in Colombia. They were raised as Christians but believe they have discovered hidden Jewish roots, prompting many to return to Judaism. Many say their ancestors were Sephardic Jews expelled from Spain more than 500 years ago, as the Spanish crown embarked on a systematic persecution of Jews. Fleeing for their safety, some wound up in the rugged northwest of Colombia, a region of tradition-bound towns long associated with fervent Catholicism. But these days, at the small, whitewashed synagogue in Bello, a working-class town next to Medellin, dozens of men and women chant prayers in Hebrew. Their leader, Elad Villegas, 36, says he and others had long felt a bond to Judaism, one they began to explore a few years ago. "It was like our souls had memory," he says. "It awakened in us a desire to learn more: Who were we? Where were we from? Where are the roots of our families?" The inescapable pull of their ancestors, people in Bello say, led dozens of families that had belonged to an evangelical church to join Villegas as he began the long and difficult conversion to Judaism. Some of them, like Meyer Sanchez, 37, say it was not easy, particularly the arduous conversion to Orthodox Judaism. "It's about showing dedication, lots of dedication, to study the prayers, learn to read Hebrew," says Sanchez. "You have to sacrifice other things, like time with your wife, time with your family, and other things you may like, video games and music." Hundreds of years ago, on the Iberian Peninsula, Jews converted to Christianity to cloak their real identities. The Inquisition was at the height of its fury. They were known as Marranos, or Anusim, and some eventually made their way to Colombia, a country not known for its Jewish culture. Today, only about 7,000 Jews live here, spread across six cities. "These people, the Anusim, would inevitably flee to those locations," says Michael Freund, who directs Shavei Israel, a group in Jerusalem that helps hidden Jewish communities. "They were usually among the first to do so, in an effort to get as far away from the Inquisition as possible." In Colombia, the converted Jews founded towns and gave them biblical names, like Jerico. And some of the given names they handed down point to a Jewish past. "They are people who call themselves Catholic but have names like Isaac, Ruben, Moises, Israel, Gabriel," says Memo Anjel, a professor at the Bolivarian University in Medellin who has studied the region's Jewish past. "And then there are also the women's names — Ruth, Lia, Clara, Martha, Rebecca." With the years, they assimilated and their historical consciousness subsided — though that was not the case for everyone, says Freund. "There are still people there who cling to the remnants of that memory and cling to what is left of that identity, and now want to make it their own," he says. Ezra Rodriguez, 33, is one of those who sought to connect with his past. Though initially a Christian evangelical, he'd long wondered about Jewish ancestors, in part because of nearly imperceptible rituals he saw among older family members. "Before I converted, when I began to study Judaism and Jewish traditions, I began to notice those things in my family," says Rodriguez, who spoke on a recent afternoon as his son, 4-year-old Yoetzel, played in an apartment decorated with pictures of Orthodox Jews praying at the Western Wall in Jerusalem. "My grandparents had unusual customs even though they called themselves Catholic," Rodriguez says. They refused to eat pork, for instance. His grandfather would also wear a hat at all times, even in church. And in the countryside where they were from, there were other signs of Judaism. Like the ponchos the farmers wore, with their untied four corners. They're nearly indistinguishable from the prayer shawls — the tallits — worn by devout Jewish men. There were also old homes that contained mikvahs — baths used by Jews for ritual cleansings. There is another piece of tantalizing evidence about the region's Jewish roots, one discovered in 2000. That was when the University of Antioquia did a study that showed that 14 percent of the men in the state had genetic markers in their Y chromosome that showed an ancestral tie to the Cohanim, a priestly Jewish cast that goes back three millennia to Moses' brother, Aaron. Geneticist Gabriel Bedoya explains that there are other genetic markers he did not study that might also demonstrate Jewish heritage. "There should be even more Jewish ancestry here," says Bedoya, who wants to carry out another, more extensive study. These days in Bello, it's not hard to decipher the Jewish influence — the new Orthodox Jewish influence. Men in skullcaps stroll the streets. The women cover their heads and wear dresses to their knees. There's an afternoon Hebrew preschool, and a kosher bakery. The bakery is run by Shlomo Cano, who used to be Rene Cano, when he was a Christian. But he'd visited Israel, and had also played saxophone in a band that performed Jewish songs for Medellin's traditional Jewish community. And so little by little, he'd started to feel the pull of Judaism. He explains it as a spark, which led him to a new religion that made him feel comfortable. "It all began to snowball from there," he says, speaking of his journey to Judaism. These days, he and his family pray daily; on a recent afternoon, his wife, Galit, leads the chants. They are working hard to raise their small children, Baruj and Gabriela, as observant Jews. Cano says it all feels right to him. "We've discovered our roots," he says, "and we refuse to disappear." While the Jewish population is concentrated in the capital city of Bogota, there are also small communities in Cali, Barranquilla and Medellin. The community has an even mixture of Ashkenazi and Sephardi Jews. The central organization of the community is the Confederacion de Asociaciones Judias de Colombia and is located in Bogota. The east Europeans, Sephardim, and Germans of the community each have their own organizations. In addition there are community centers, youth organizations, and Zionist organizations such as WIZO and B'nai B'rith. There are nine synagogues, four of which are located in Bogota, with a total of 13 rabbis officiating in the community. Kosher food is readily available. Bogota, Cali, Barranquilla, and Medellin each has a Jewish school. In Bogota there is also a kollel and many Jewish study groups. Jews have an active cultural life, with six publications and two Jewish radio programs. The Museum of Alfredo de la Espriella has dedicated a gallery to Judaism and Jewish subjects. Aliya: Since 1948, 1,570 Colombian Jews have emigrated to Israel.